2013 Grad student Paolo Pennuti in collaboration with Annie Briard. Under the direction of Sean Arden, with special thanks to Dafna Vallejo. 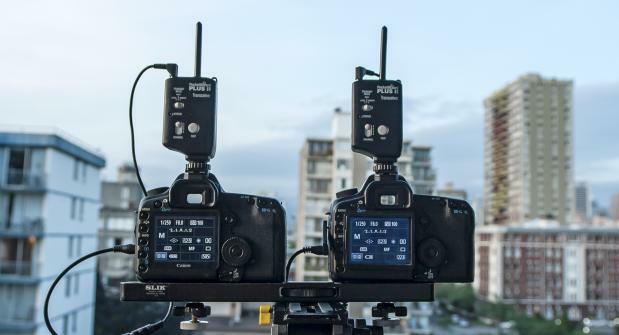 How can you shoot a side by side 3D time lapse using two Canon 5d Mark II (or any other DSLR camera)? How do you sync the two cameras? Is it necessary to align the cameras with a 3D monitor before shooting or can you roughly align the cameras on the field without a 3D monitor, and then correct the alignment with After Effects? Capture still pictures at regular intervals with two Canon 5d Mark II (left and right eye) for a side by side 3D time lapse. Sync the two cameras and test the alignment with and without a 3D monitor. Process the files with After Effects to produce the final 3D sequence. DSLR cameras are the most portable and cheapest devices available on the market to shoot 5k 3D still RAW images. Three pocket wizards, another DSLR camera and a remote control are necessary in order to sync the shutter buttons of the two main cameras at constant time intervals (it is possible to avoid using another camera and the camera remote controller but it becomes necessary to manually press the shutter button to shoot). Even though setting up alignment with a 3D monitor is recommended before shooting, it is still possible to get good results without using one. After Effects is very effective as a tool to correct most alignment issues.